Contact Arlington -- customer service -- to see if they've got UL/CSA literature that backs your contention. Your best shot at winning the AHJ over comes from authority. This is especially true when the issue turns on a specific product. 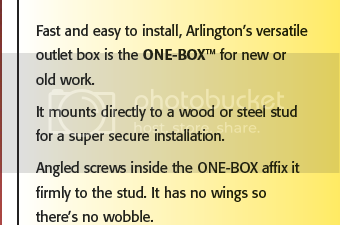 A four-gang box is pretty uncommon in residential. With any kind of wiring discretion, my impulse is to design away from such a box. Obviously, any support scheme is sure to compromise Arlington's depth adjustment scheme. "shall be rigidly and securely fastened in place." If the far end is not secure and rigid, you need better bracing. I just looked around the Arlington site, and see no info. I have to go with Greg....far end moves, it needs bracing. On there specifications page it says "super secure" and "no wobble". Since they are flat against the stud they do not move, and are rigid and secure. I would think this meets the requirements of 314.23(B). We emailed Arlington and are waiting for a reply. I guess I am having trouble understanding why a listed product cannot be installed per the instructions. It is still my belief that the inspectors have been seeing them with the extra brace for so long they assume that the extra brace is required. Last edited by BigB; 11/04/14 11:25 PM. I saw what you posted, but I don't see any reference to the 4 gang. If you mount it and it's solid, I would have no issue.